Live on BBC One, BBC HD Channel, Red Button, BBC Radio 5 live, mobiles, tablet and the BBC Sport website from 12:55 BST. Also live in 3D on BBC HD Channel from 15:30 BST. Knowing I am through to the final of Wimbledon fills me with so many emotions, but all of that will count for nothing unless I come away with the title. The only thing I can afford to focus on is my game and Roger Federer. He is a player I've beaten in the past, and I can do it again. My coach Ivan Lendl and hitting partner Dani Vallverdu will sit down to study his matches so far this fortnight and some of my previous meetings with him, then we'll talk tactics. I don't like watching my matches back - things change very quickly in tennis and you have to look forward - but I will reflect on what I've done well against Roger in the past and certain performances at the latter stages of Grand Slams. He is arguably the best player of all time. There are a few guys who have a decent claim, but I'd say Roger and Pete Sampras. Sunday will be a great challenge and one that excites me. Although it's I was in this position at the 2008 US Open and the Australian Open in 2010 and 2011. I know how it's going to feel and although there will be nerves, I know how to deal with them and use it as a positive. Of those finals, losing to Novak Djokovic in Melbourne last year was the most painful, and it's one of the factors motivating me to lift the trophy this time round. Since I left for Spain 10 years ago and decided I wanted to become a professional tennis player, these are the moments I've spent every day working towards. I moved away from my family at the age of 15, lived and trained in another country. I had to do that to get where I am today, challenging for the sport's biggest prizes. 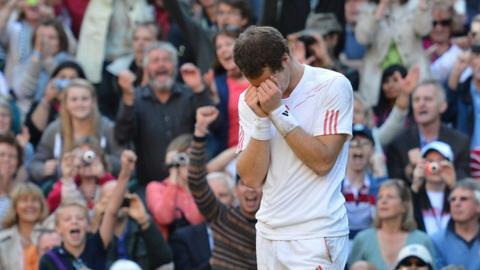 It hasn't been an easy journey and after beating Jo-Wilfried Tsonga in the semi-finals on Friday I was quite emotional. Before doing my post-match interview I went to the bathroom and just sat there, splashed water over my face and calmed myself down. My attention then switched to the final. When you make it to this stage of a tournament it can be easy to get distracted, but I've kept things as normal as possible. A spot of practice, plenty of physio, chats with my team and walks with the dogs. On Sunday I'll wake up at around 9am, have some breakfast, make my way in and warm up for the last time before packing my bags in the locker room and changing into match kit. Eventually, the wait will be over. The one thing I can guarantee is that I'll fight my absolute heart out. I need to give everything I have from the first point to the last. Roger won the the first of his 16 majors at Wimbledon in 2003. I was playing in the juniors that year, hoping one day I could do the same. Now I have my chance.